Many years ago I had a recording session in a studio that used a 16-track on 1-inch tape machine. I owned an 8-track on 1/4-inch machine. So I had the studio make a stereo mix for me that I could play on my machine and work on the vocals until I got what I needed. After I moved all my audio to Pro Tools, I found the stereo mix had deteriorated because I had played it so much, although the vocals still sounded fresh. After all, it was the last vocal takes that I kept. I rented time with the 1-inch machine and transferred the separate tracks into Pro Tools with the plan to import the vocals I had worked so hard on. Matching the waveform of the first note of my vocal to the downbeat of the verse, I let it play. It sounded perfect – for about thirty seconds. Then it began to drift! Apparently the tape with the vocals had stretched just enough over time that by the end of the song it was off from the multi-track by a full beat! How am I going to fix this? 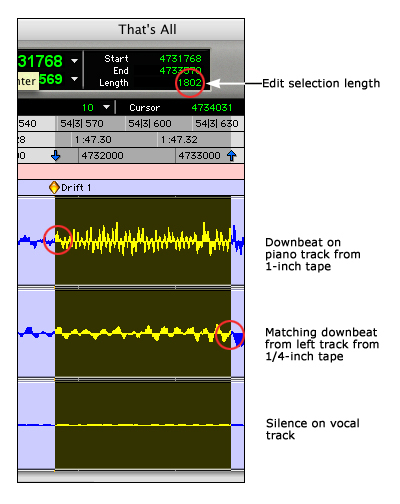 The method I outline here—to resynchronize tracks recorded on different tape recorders—will work equally well for one or more tracks of any kind. The main requirement is that you have at least one track from each recorder that shares musical material and plays pretty much from beginning to end. You can use the same method if you have a time code reference such as SMPTE or MTC, although you may have difficulty spotting the matching frequency waveforms. If the sync problems are due to major difference in machine speeds, you may also have some pitch correction to deal with. My first go-round was to use the Pitch N' Time plug-in (see the sidebar) to shorten the vocal, forcing the beginning of my last note to match the backing track. But that didn't work since the 1/4-inch tape had apparently stretched by different amounts in different places. (The modulated last chorus was a bugger, so I had to sing it quite a few times.) If I were going to make this work, I would need to break the vocals into sections and perform multiple time compressions and/or expansions. You might think it would be easy to just clip the vocal into smaller sections and go at it that way. But the job of a vocalist is to be expressive, and that doesn't lend itself to being particularly accurate with regard to time. So it helps to have a more rhythmic reference – which I had in the form of the stereo mix of the backing tracks. I imported the vocal and one of the backing tracks together. Now both regions have the same starting and ending point. I grouped them so that moving either track will move the other. No sense in having another sync problem. To find the correct starting place for the vocal I used the backing track and lined up the start note with the start note of the piano from the original 1-inch, master multi-track. I switched to Pro Tool's Shuffle mode and zoomed in so I could see the waveforms clearly. I moved the grouped tracks manually with the Grabber tool, set the Ruler to Samples, and set the Nudge to 10 samples. It's easy to click the < or > key until the samples match up. After the intro played, the vocal (or whatever track you're working with) lined up right where expected. Next I played through the song listening for a clear disagreement between the parts looking for a place where the vocal stopped for a second or two. I found a likely place at the end of the first chorus. I clicked on the transient (the beginning of a note) on the piano part from the 1-inch tape and dragged down across the backing track to the matching transient there. You may want to use the Audio Zoom In tool in order to make the audio waveform taller. See it circled in Figure 2. I clicked the Enter key to bring up the Memory Location dialog and created a Marker titled "Drift 1." Then I wrote down the length of the selection edit. In this case it was 1802 samples as in the picture at the top of this article. The reason you need that number is that you might not be able to find a silence in your "keeper" track, as you'll see shortly. In a couple instances I needed to move my marker and find a different spot, so knowing that number is very helpful. Switching to the Selector tool, I clicked at the right boundary of the selection on the two grouped tracks and zoomed in to find a "zero crossing" just before the backing track note started. It's actually more important to find a zero crossing point in the keeper track, which for me was the vocal. Choosing a zero crossing helps to avoid creating a click in your edited tracks. I'm not worried about clicks on the backing track, because I'll be discarding it at the end of this process. I typed "B" to break the audio across the 2 grouped tracks. I changed the Trim Tool to the Time Compression/Expansion Trim Tool by clicking and holding down the button. It's on the right of the Zoomer tool's magnifying glass icon marked TCE in Figure 2. I dragged the right end of the grouped tracks to the left until their edge lined up with the Drift 1 marker. I suggest you go slowly and keep your eye on the blue marker ruler for the gold diamond. It's not essential to get the exact spot. Even 100 samples probably won't be a bother. If your tracks are shorter (probably due to slight differences in recorder speeds), you will need to lengthen them. After you make your selection and create your marker, you'll need to move the marker to the right edge of the selection. Then you'll be working with a break to the left of your marker. To get the unprocessed regions out of the way, you'll need to switch to Slip mode. Using the Grabber tool, click on the grouped regions to the right of the break and drag them further to the right so they're out of the way. Then use the Time Compression/Expansion Trim Tool to drag the right edge of regions you're working on to the right until you get to the marker. When you're done, switch to Shuffle mode and drag the unprocessed regions up against the processed one. At this point it's important to listen back. Your reference track may contain transients from other instruments that aren't an exact match for the solo instrument track. It might look like you have the right trim point, but your ears will be the final judge. I soloed the backing track and the piano track and found they matched very well indeed. I turned off the backing track and turned on the vocal and it was exactly as I had hoped. However, if it doesn't sound right, you can perform a couple Undos and try again. To continue the process, I zoomed out and put the selection tool on one of the tracks in a position about the same length as the first region, again looking for a break in the vocal track to make my work easier. I zoomed back in, made a selection, adding a marker titled Drift 2 and repeated the steps. Depending on my source material I've had to run the process anywhere from three to seven times in a three minute song. Doing the final alignment is a little tricky because the end of the region will most likely fade to silence. That means you'll want to match up with a transient earlier in the region. What I found works pretty well is to look for the final silence before the last big note, split the audio there and run the process. The little tag region should line up just fine for the remaining part of the song since it's not likely to drift much even if it's up to 30 seconds long. Finally I ungrouped the imported tracks and deleted the backing track. I only kept the vocal, which now matched with the original multi-track as if the parts were always meant to be together. I selected all the vocal regions, went to the Region menu and selected Group. That way the entire track acts as one audio region. Then I deleted the markers. So you can see that without too much trouble you can bring different sets of audio back together. And isn't it so much better working with them in the digital domain? I found Pro Tools own Digidesign TC/E (Time Compression/Expansion) gave me unwanted audio artifacts when changing the length of audio by any appreciable amount. Serato's Pitch n' Time (PNT) plug-in for Pro Tools has been the professional standard for some years. At $800 it's not cheap, but I found a copy on eBay for half that. Serato has an LE version for $400, but I haven't tried it. There are other TC/E plug-in available now, but I haven't tried any of them so I can't make any recommendations. You can download a free demo of PNT at http://www.serato.com/products/pnt/. Jonathan Stars has been a musician and recording engineer for more than 40 years. He is also a FileMaker Pro database expert who has written six editions of "Learn FileMaker Pro" for Wordware Publishing. His novels can also be found on this website by clicking here.